I don't leave home without this hat. 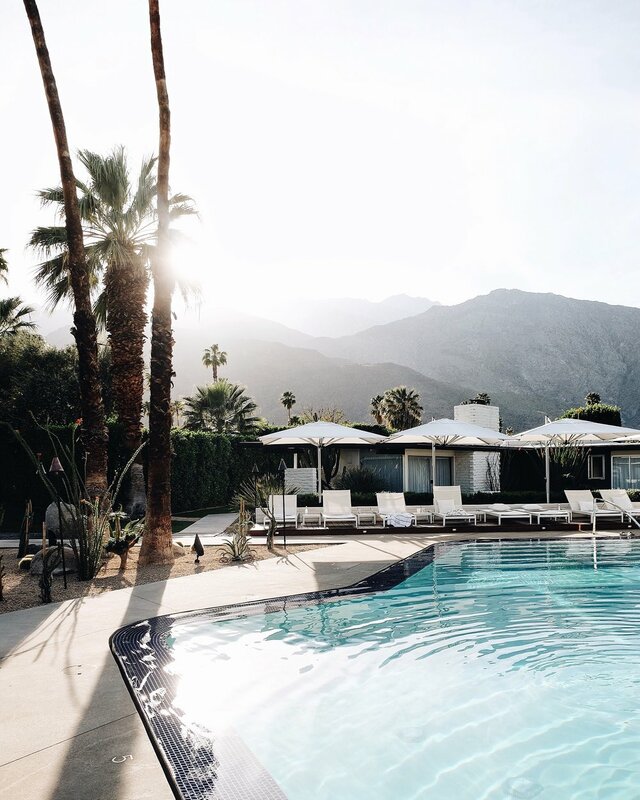 The newly opened L’Horizon Resort & Spa is the former residence of Hollywood Mogul Jack Wrather, where Marilyn Monroe was a frequent visitor. Guests are treated to extras like complimentary poolside foot massages and chauffeur service to nearby restaurants, but the cherry on top is the personalized engraved brass nameplate on each bungalow door. The on-site restaurant Sopa is well designed and features a menu nibbles like hummus and flatbreads. A crowd favorite, The Parker features bright and kitschy interiors by Jonathan Adler (think shag carpeting and neon signage), with a lobby full of Instagram-worthy nooks and crannies. Guests can sip nightcaps around a roaring orange metal fireplace during chilly months . Tip: Book in advance; it’s popular for weddings and events. The Ace Hotel is a popular spot for girls weekends and bachelor parties, so if you're looking for peace and quiet you might seek quieter pastures. Nightly karoake is offered at The Amigo Room, or check out the daily yoga classes. Tip: Don't miss brunch at King's Highway. The Sparrows Lodge is a refreshed 1950's rustic collection of 20 barn style rooms, with a relaxing pool and fire pits (it does get chilly in the desert in the evenings!). Tip: The Barn Kitchen serves family style suppers to a select number of guests with advance reservations. King's Highway at The Ace Hotel is a reimagined retro diner (the building is a former motel and the vibe is alive and well). Take your pick from lamb meatballs, avocado toast or devils on horseback...it's all delicious. Wash it down with creamy date shake (a local speciality you’ll find on menus all over town), or refuel with a cup of Stumptown coffee. Be prepared to wait for brunch at Cheeky's. The good news is, you'll be rewarded with an excellent meal. Try a bacon flight, featuring flavors like jalapeno or apple cinnamon, but whatever you do don't miss the buttermilk waffle with salted butter. Birba is an excellent option for dinner. The pizzas are OK, but the real stars are the pastas and chicken pesto meatballs. Workshop Kitchen + Bar has an inventive cocktail menu that reads like poetry. Stay awhile and try a few. Best paired with the African spiced chicken for two (though we made it work for 4 with plenty leftover to boot...). Dinner al fresco at Norma’s is a Palm Springs rite of passage. The menu features comfort food classics with a twist, like apple pie milkshakes and lobster pot pie. Tip: Breakfast is served all day, so feel free to hit snooze. Blending in with my cactus clutch. The Aerial Tramway is a great way to see the entire valley and the gorgeous San Jacinto mountains. Tip: There’s a cocktail lounge at the top; time your trip with sunset for a truly stunning view. best vintage in the area. Check out Moorten Botanical Gardens for an up close look at cacti and succulents native to the region. Rent a bike and cruise around for a look at some of the best Mid-Century architecture and design. 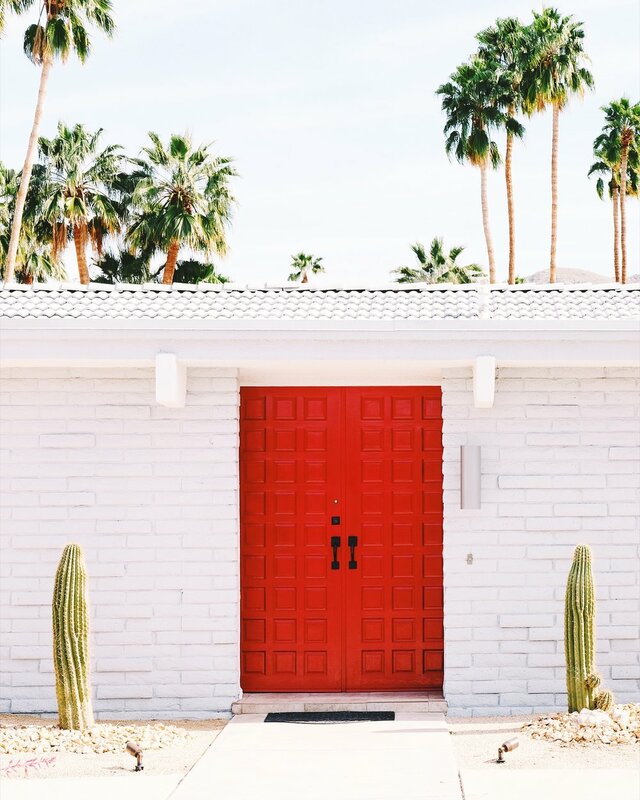 Or, time your trip with Modernism Week for a peek inside these incredible homes. If you’re heading back to LA, leave some time for a pit stop at the Cabazon Outlets, with high-end shops like Barney’s New York, Prada and Valentino.